As you all know, Todd Reesing attended Lake Travis HS in Austin, Texas. What you may or may not know is that until he took the reigns his junior season they pretty much sucked. Their best season ever was a 7-5 campaign in which they were Bi-district champions. The following three years they would go a combined 4-26. Todd would then take over, become the Texas state player of the year as a junior and lead them to 8-3 as the District champs. As a senior they would go 11-1 as Bi-District champs. Since he graduated they've gone 8-3 (District champs) and 15-1 (State champions) and they're set to defend their State Championship this Saturday. And yes, I attribute all of this success to him. 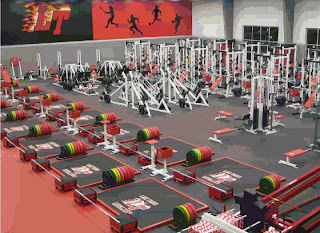 As for the picture, that's the weight room for the football team at Lake Travis. You can see the rest of the weight room pictures here. 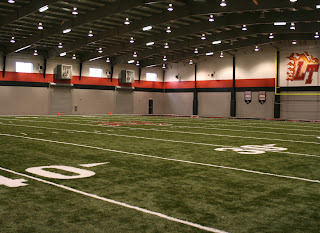 The one below is their indoor practice facility. The rest of which, in addition to the film room, offices and statues of alumni (yes, Todd has one) can bee seen here. Perhaps we're going to need to come up with another $31 million if these are the facilities high school athletes are now enjoying. If by 'impact' you mean those gay rainbow weights, then yes, definite impact. Multi-colored or not that is a jaw dropping facility. Love that Chizik dig. I will never understand what they're thinking there. I read somewhere that it's like shooting a three quarter court shot 5 minutes into a basketball game - even if it goes in, it was still a stupid shot to take. I heard Chase had quite an impact on Southlake Carroll as well...they built a Whining Room specifically for him when he was frequently denied admittance to the Clutch Room. Of course the Whining Room came complete with vending machines filled with twinkies and ho-hos.